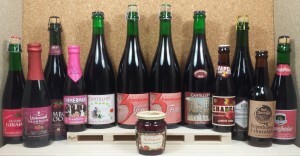 By now many of you are already familiar with Belgiuminabox’s line of tasting favourites. But what happens if you can’t pick a favourite ? A recent discussion about Boon Black Label & Boon-Mikkeller Bone Dry was going on in the past few months. Is Boon Black label the same beer as Boon Mikkeller ? Acoording to the brewery, it is not. According to some who drank it, it is. This raised questions in our team. What other beers are know as a “split decision” ? We have tried many beers in our career and some of the beers that are very alike, are very hard to pick a favourite from. We have put together 2 very alike bundle-packs that we think are very equal, yet very different. We couldn’t decide what to upload, so we uploaded both of them; for you too choose from ! Of course you could always pick both, share them on a tasting with friends and family and to see which ones you decide are the best ! You can get yours right here, untill supply lasts. Get ready for higher temperatures with refreshing fruited beers. Raspberries are very well known for its subtle sweet-sour combination thus we made a package containing both sweet and sour raspberry beers. You can get yours right here.